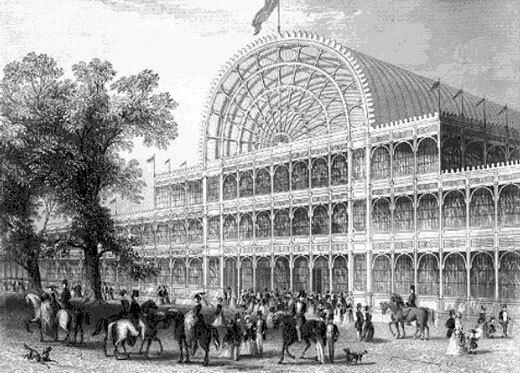 The Great Exhibition of the Works of Industry of all Nations was an international exhibition that took place from May 1st to October 15, 1851 outside London, England. 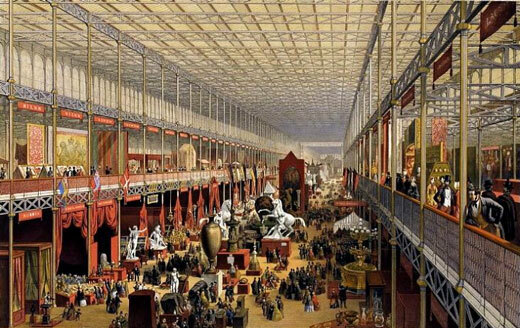 It was the first of a series of World Fairs of culture, technology, and industry that became popular during the nineteenth century. It laid the groundwork for all subsequent World Fairs that included the famous Paris Exposition Universelle of 1889 and the 1893 World’s Columbian Exposition in Chicago. 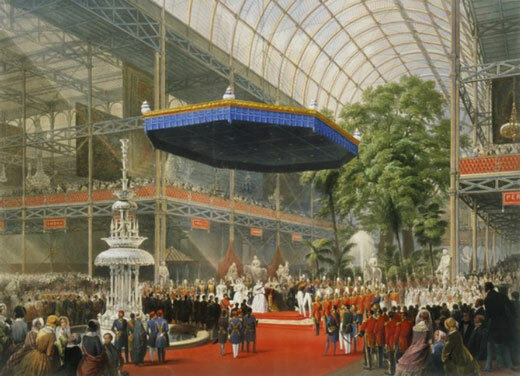 Organized by Prince Albert and the Members of Royal Society for the Encouragement of Arts, Manufactures and Commerce, the Great Exposition was meant to show the world England’s leadership in industrialization. The exhibition, which ran for six months, was wildly popular and attracted over six million visitors. 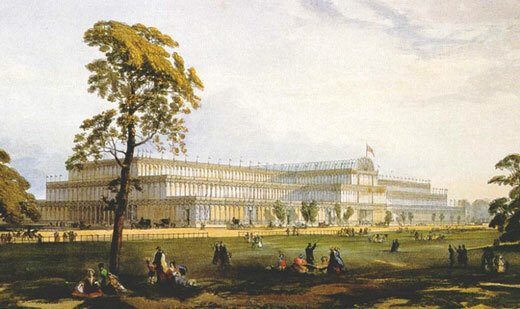 In 1850, the Royal Commission announced an international invitation for architects to submit design proposals for the construction of a great building to house the exposition. In response, approximately 250 architects submitted design proposals. For better or for worse all of the designs were rejected primarily because of cost or too lengthy of construction times. 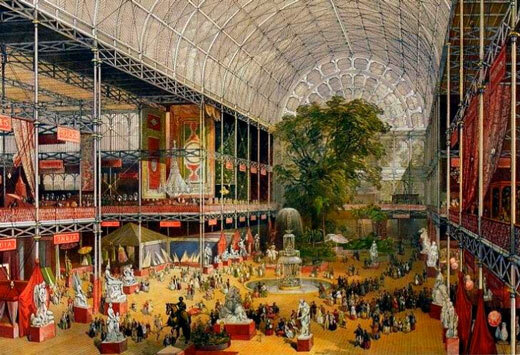 But late in 1850 the gardener and greenhouse designer Joseph Paxton submitted a design for essentially a gigantic greenhouse. Immediately accepted with substantial modification it was constructed in less than nine months’ time. It was immediately maligned by the larger architectural community for not embracing the traditional values of mass, void, and spatial articulation, but the public became enamored with it. Its futuristic visual effects, the dematerialization of the exterior walls, its enormous size yet lightness, as well as, its saturation in natural light all created a dramatic visual effect. The reduced construction time and cost were due primarily to the mass produced and prefabricated components that made up the structure. Techniques that had been recently developed in English factories were applied for the first time on a building scale. To streamline the process a limited number of parts were manufactured in vast quantities and repetitively assembled by thousands of workers. There were 3,230 columns, 2,141 girders, and over 1,000,000 linear feet of sash bars. Also important were recent developments in the inexpensive production of glass. Just a few years earlier the production of rolled plate glass was invented by the Englishman James Hartley. He developed the process where molten glass was first deposited on the smooth cast-iron bed of a rolling table. A large roller was then passed over the surface of the soft glass that formed the glass to a constant and uniform thickness. The glass was then cut and trimmed to the desired size and finally passed through an annealing tunnel where it gained its final strength. Over 900,000 square feet of glass were produced for the building – more than any other building in the world at that time. The visual effects for the Victorian visitor must have been astonishing. With its tremendous scale -- 1,851 feet in length (a play on the fact that the exhibition was held in 1851) by 456 feet in width and 128 feet in height the light-filled vistas must have been awe-inspiring. The vistas must have seemed to have faded into the horizon. And so great was the light during the day that no supplemental lighting was needed to illuminate the interior. The light was even so bright and the building so tall that one of the great elm trees that was living on the original site was spared and the building built around it. Even today we rarely see such a building so transparent and visually dematerialized. But all this unfiltered glass was not without problems. The building had a strong tendency to overheat even in the mild English weather. To counter this a canvas screen was installed on the outside of the glass to filter the harsh sun. The cooling effects of the screens were also enhanced by spraying them with water. On the interior the light was softened and given a light egg-shell hue. To help animate the interior much of it was colorfully painted. The structure, the vertical surfaces, struts, and columns were all painted a light blue. The undersides of the galleries were painted a dark red and the column capitals were painted a dark yellow.